The 1st deadline in The Guild 2011 Build is due on the 28/2/11. 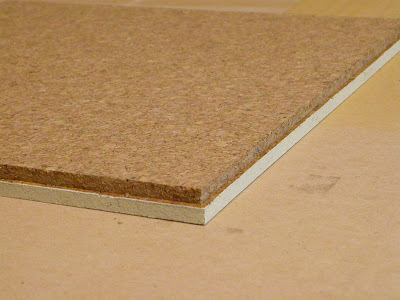 For me this portion of the project is to build a 4' x 4' gaming board out of 1' x 1' cork tiles. The top was to be painted instead of sanded or flocked so that all the scenic items can be placed flat on the board without creating shadow lines. This had been tested a few months ago with a smaller prototype of 1 tile painted and 1 scenic item modelled on 1mm plasticard. It worked well. I purchased 1' x 1' cork flooring tiles from the local carpet store. I always ring them regularly and watch out for incomplete boxes they need to offload after a job is complete. This is because the tiles themselves retail for about $5 each. A box of 50 costs around $175 or $125 direct from the distributor. Not good enough. So far I have purchased a box of 37 for $50 and a group of 18 for $25. Good stuff. For a 4' x 4' board I need 16 x tiles. But I always double my tiles to help keep them flat and so I can model in depressions and rivers and such so I really need 32 x tiles. I tried using a cheaper material for the bottom half but even 5mm foamcore ends up dearer and needs measuring and cutting. So back to 2 tiles I went. I always lay out the tiles 1st so I can swap and change them around and make I get the best set for the top layer. That is they are all sqaure and nice and straight cut. The 2nd layer of tiles I then trim 10mm off 2 of the edges of each tile. This is so when they go together, the bottom tile is not slighty overhanging the edge of the top tile. Luckily the last 2 sets of tiles I purchased were preglued and when both tiles are turned in with the glue facing each other, they stick together really well. This bypassed the need to glue and press each set of 2. Once all the sets of 2 tiles are together, I stand them all up on their edge and with a roller brush, paint the edges the top colour of my colour scheme, in this case a light beige colour. I then lay out all the tiles as though I am setting up for a game and apply a liberal layer of my under colour - caramel - with a roll on brush. This I leave to dry for a while. Then I come back over the top with a light brushing of the roller brush (dry brush) of light beige. This dries for 24 hrs before I spray the whole lot with a sealer, in this case a matt painting sealer I got from the art store. Ever thought of using MDF for basing? 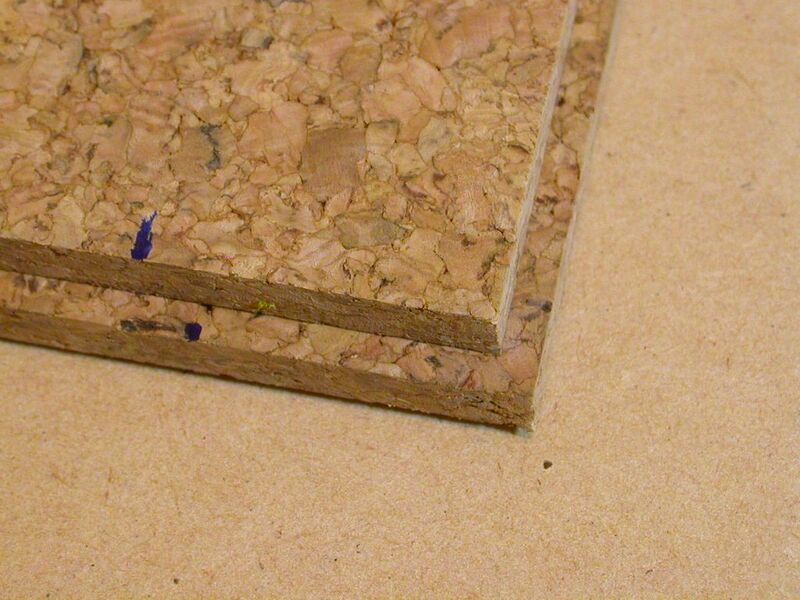 It's massively cheaper than cork (I got four 4' x 2' boards cut for £10 - I suppose $15?). 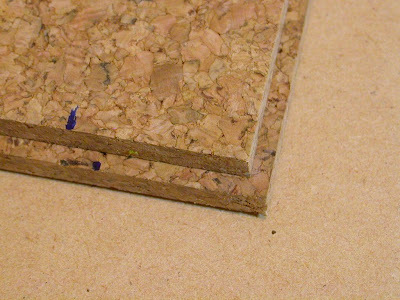 I did try using mdf at one stage but they are harder to pack away for travel or storage and when I tried getting them smaller to help with this, the hardware store couldn't even cut them straight or to the same size. I like this, it looks good and seems fairly straight forward. Do you have plans for cutting roads and rivers into the board? Roads I'm not so sure about. Probably be modelled on top of the board as most roads in this area are above the terrain they pass through. Rivers I will cut in using the same process as for the Euro terrain I did earlier last year.